eat run sail: Could the 21 Day Fix be the Fix For Me? Mini confession here... I have to admit to being somewhat food and nutrition obsessed. For the past few weeks I have been making an attempt to work with IIFYM - If It Fits Your Macros - to come up with a food plan that I can follow and use to knock off a couple of pounds of fluff. I have been strength training 3 times per week and also walking a lot. I have not had a great deal of success... I have had a few mini losses and a few mini gains and what I find is that all I think about is food, to make sure I am hitting my numbers. I think it is not really mentally healthy. So, I have decided to change gears. 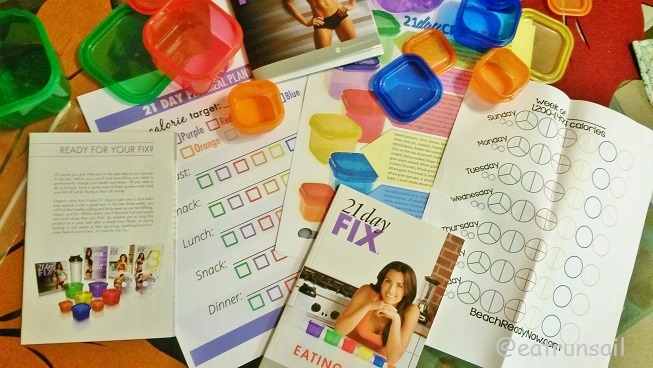 I bought the 21 Day Fix when it was first released a couple of years ago, and although I do like some of the workouts, I never really gave the colored-container food plan an honest trial. I read it through, decided it was too restrictive and put the colored containers away in my cupboard. This past week I saw that my BeachBody Coach is running a Holiday Challenge group and I jumped right in. I have been assembling the tools and information I need to follow the 21 Day Fix food plan and I am ready... mentally ready too. Yes, I know that nuts and seeds and healthy oils and nut butters are limited. Yes, I know that I cannot have cheese and avocado on the same day. Insert sad face here... but on the positive side... I no longer drink wine so that will make it much easier. I know that if I am hungry I can fill up on raw veggies... going over my GREEN container count for the day is not a serious infraction and will be my back up plan. Yes, there is a set of cute colored containers with lids, and each color represents and different food group and they are all different sizes. According to the formula suggested, I calculated my food allotment by container. All totalled, it is supposed to come to between 1200 and 1499 calories per day... which certainly is in the range of where I was with IIFYM and with Weight Watchers too. But looking at it, it doesn't seem like very much food to a girl who can put away 3 cups of spinach and greens at lunch in a salad! And who can toss back a handful of almonds in a flash. Which is probably why I am struggling with those few pounds in the first place, right? each morning I am going to write myself a food plan for the day according to my schedule of activities for the day. I am going to up my workout game this week and do 4 strength workouts M, W, Th, F using the 21 Day Fix DVDs and my Reebok Kettlebell workouts. I plan to run today. I am going to track my food intake on my colored charts as well as in My Fitness Pal to see what I am actually consuming. If I am truly hungry, I will eat veggies/fruit to get me through to the next planned meal. And being somewhat rebellious, I am not going to use the GREEN containers to count my leafy greens... baby Spring mix or spinach, only the other veggies that I eat. And I intend to report back my progress... what was planned vs. what actually happened. Here goes... wish me well! Do you follow a particular food plan? Do you have any experience with the 21 Day Fix? I don't follow a food plan but need to cut back on sugar. I've done the 21 day fix workouts with a co-worker last year and love them but that's as far as I got! Good luck! Thankfully, I'm not in the market for cutting calories or portion control...but I know I need to clean up my diet. UGH. I know sugar is my go-to because it tastes so good and because I'm not really worried about the calories (and honestly, kind of need to UP my calories a bit). I'll be curious to follow your progress. Sounds like you have a good plan in place. I haven't tried the 21-Day Fix myself, but I think it's a great way to kickstart a diet or shed those last few pounds. You're going to crush it! I do not follow a food plan--unless you count avoiding corn and corn-based products. Flares up all kinds of troubles for me. I've heard good things about this 21 day fix, tho. Good luck! I don't follow any particular plan. The 21 Day Fix can be great getting people situated with better portion control and cutting back on sugars and other things that might be less desirable in the diet. Good luck! I had success with a food exchange based program (x servings of protein, grains, veggies, etc.) when I first lost weight. I liked the flexibility and being a step away from calorie counting helped me obsess less. I like how it forces you to eat a balanced diet and agree there's no reason to limit leafy greens. Good luck, I a, excited to see how it works for you, I have been thinking of trying it.